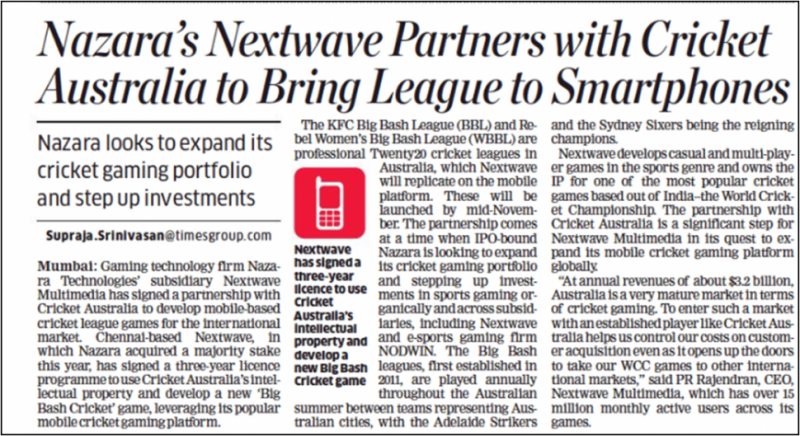 Nextwave Partners with Cricket Australia! Next Wave Multimedia, has partnered with Cricket Australia to launch a new ‘Big Bash Cricket’ game, leveraging their popular mobile cricket gaming platform. The KFC Big Bash League (BBL) and Rebel Women’s Big Bash League (WBBL) are professional Twenty20 cricket leagues in Australia. Cricket Australia has signed a three-year license with Next Wave Multimedia to develop unique mobile games for fans of the Big Bash leagues across the globe. This is a significant step for Next Wave Multimedia in its quest to expand its mobile cricket gaming platform globally. “I’m really excited to take our mobile game ‘Big Bash Cricket’ to the next level in collaboration with Next Wave Multimedia,” “We look forward to offering Big Bash fans in Australia and around the world an even more realistic representation of the game they love with improved graphics and gameplay as well as all new features including a multiplayer option.” says Patrick Horan, Cricket Australia’s Digital Gaming Manager.